Tibial Tuberosity Advancement (TTA) is a surgical repair method for a ruptured cruciate ligament offered at Blue Sky Animal Hospital by Dr. Robert Porter, DVM. Dr. Porter has 20 years experience in Orthopedic medicine and surgery. One of the most common knee injuries seen in medium to large breed dogs (although they can happen in any breed) is a ruptured Cranial Cruciate Ligament (CCL) which is also referred to at times as the Anterior Cruciate Ligament (ACL). The job of the cruciate ligament is to connect the back of the femur bone (thigh bone) to the front of the tibia bone (shin bone). The ligament prevents excessive motion between the two bones. This ligament can have either a partial or complete tear that can lead to instability of the knee and cause permanent damage to the meniscus (knee cushion). If left untreated, permanent debilitating pain and arthritis can occur due to the instability. TTA surgery brings stability to the knee join by changing the angle of pull by the pateller tendon from the normal 115 degrees to 90 degrees. 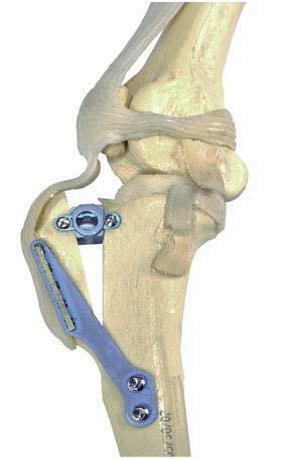 This counteract the tendency of the femur to slide backwards on the tibial plateau (called tibial thrust).The surgery involves making a cut in the front of the tibia bone (tibial tuberosity) and bringing this portion of the bone forward to realign the pateller ligament so that the abnormal sliding is eliminated. A bone spacer, plate and screws are used to secure the bone in place. Blue Sky Animal Hospital offers pain management, rehabilitation and laser therapy post-operative for your pet to ensure the best chances for optimal recovery (see section on rehabilitation and laser therapy). Post-op healing and instructions vary for each pet and is dependent on a variety of factors. These will all be discussed with you when your pet is discharged after surgery.